Single Adjustable Webbing Side Release Buckles can be threaded on one end making the webbing on that end adjustable to any length, the other end of the buckle has the webbing permanently sewn in. Available in 3/4", 1", 1.5" & 2" sizes. Dual Adjustable Webbing Buckles Can be threaded on both ends making the webbing adjustable on either side of the buckle. Available in 3/4", 1", 1.5" & 2" sizes. 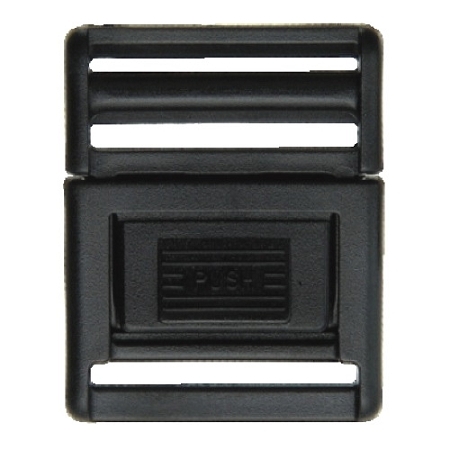 Center Release Webbing Buckles are released by pressing the button in the middle of the buckle. Can be threaded on one end making the webbing on that end adjustable to any length, the other end of the buckle has the webbing permanently sewn in. Available in 3/4", 1", & 1.5" sizes. 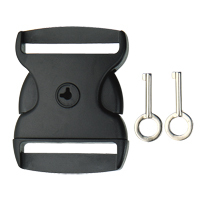 Lockable Webbing Buckle comes with a key enabling you to lock the buckle. 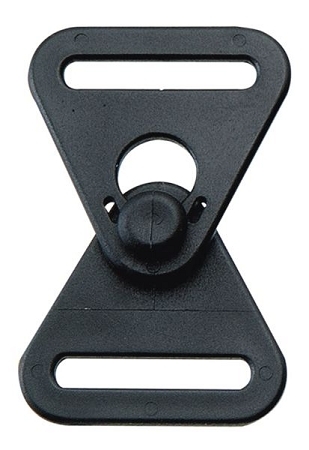 The most popular use for this buckle is for hot tub covers but can be used in many applications such tackle boxes, storage boxes, coolers....etc. Spring/Footman Webbing Buckles were extensively used by the military and are still big in Surplus Stores. 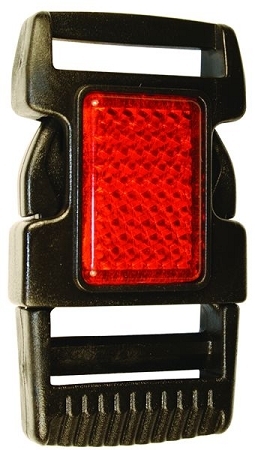 This Buckle is hard to beat when used for light duty, non-critical applications. They are easy to cinch by pressing the button, feeding the webbing through the mouth and pulling the webbing to tighten. Miscellaneous Webbing Buckles including Galluse and Mountable release Buckles. 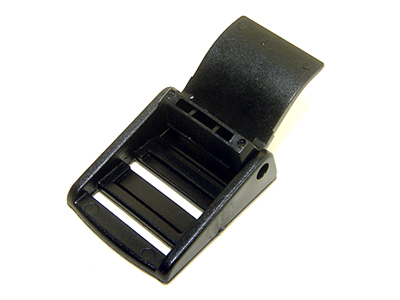 Cam Buckles are an ideal fastener for tie down strapping, belts, adjusters for backpack straps, bags and are applicable for marine or industrial applications. One end of the webbing is sewn and fixed to the cam buckle and the other end is fed through the cam and locked in place by closing the lever. 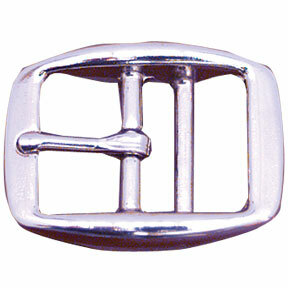 These Nickel Plated Tongue Webbing Buckles have a mirror-like finish. 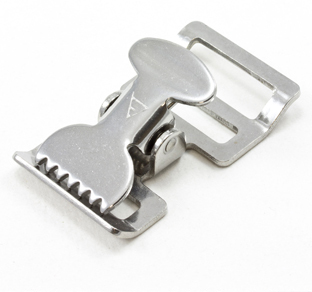 This conventional buckle with a frame, bar and prong gives the most reliable and easy-to-use closure. Collars, belts, harnesses, backpacks, para-cord bracelets, and a lot more can be created with this versatile hardware. 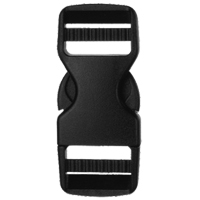 Webbing Strap Buckles offer quick release action along with webbing grip and adjustment. Webbing Release Buckle styles include Single, Center & Dual Release, Footman, Tongueless, Cam, & Galluses Webbing Strap Release Buckles.